The sleeper who wakes in a room that receives the early sun is thereby braced in health and spirits for the day. Apart, however, from its tonic effect on the spirits, sunlight is the worst enemy of the deadly disease germ. Course of cold air entering a room through spaces between badly fitting floor boards that the rooms are so planned that the bedstead may be placed conveniently. Usually there is only one possible position for the bedstead, as windows, door, fireplace, and cupboards usurp more than half the wall space. The bedstead should stand so that it is not in a direct draught between the door and the fireplace. It is preferable also that the sleeper's eyes should not face the window, though individual preference varies on this point. Again, it is well that the head of the bedstead should not be too near a window. The ordinary robust person nowadays sleeps with the window open, and British weather is notoriously treacherous. The bed-head should stand against a wall, leaving space on both sides. Bedsteads should never be put with a side against a wall, because the sleeper, when facing a wall surface, is breathing stagnant air, in fact, re-inhaling his own breath. Moreover, the "making" of beds so placed involves extra labour. Each bedroom in its turn should be considered with reference to the various points mentioned above. After making sure that the plan in each case permits of placing the bedstead in a way to secure comfort, health, and cheerfulness, it is well to see what the remaining space allows of putting the dressing-table at a window and the washstand in a convenient place. If a wardrobe is to be added, then space for that also must be found. 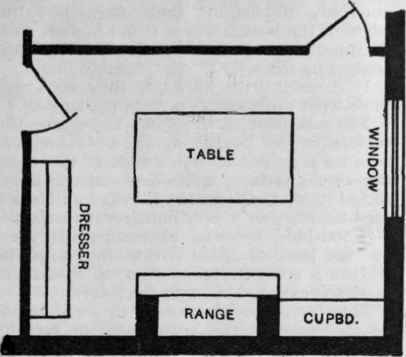 It is not unusual to find that the only possible position for the bedstead clashes with a convenient arrangement of one or more of the other items of furniture, but these are questions which the experienced house-hunter, armed with a list of measurements of the principal pieces of furniture and a foot-rule, will settle quickly. Bedroom fireplaces having the old-fashioned "register" are to be avoided. This appliance is apt to be closed, either with intention, or by the chimney down-draught, and then the room becomes an unventilated box, and the sleeper gets up with an inexplicable headache. 1,000 cubic feet of air would hardly suffice for one person beyond twenty minutes. 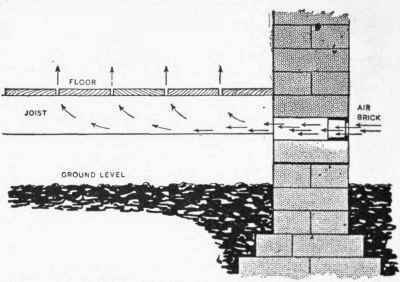 When we consider that this amount of space is represented by a room 10 ft. by 10 ft. and 10 ft. high - a not uncommon size for small bedrooms - it becomes apparent how important it is that adequate means for changing the air should be provided, and the significance of the open flue explains itself. In these days of speculative building the tendency is to cut down the number of cupboards. Bedroom cupboards are a very real boon. A roomy cupboard, provided with conveniences for hanging clothes, renders the wardrobe superfluous, a consideration to the novice in house furnishing who may not be over-burdened with means. No room can be considered comfortable if the doors and windows do not properly perform their offices. In cheaply built houses doors of light scantling have a way of warping out of shape, and then do not close tightly at all points. This means that a constant draught of cold air will pass from without inwards. Thick doors are generally free from this defect through warping, yet may be so badly fitted in the first instance as to allow too much space at the bottom or top. That these faults are only too common is witnessed by the many yards of "draught excluder "sold by the local ironmonger. Opinions differ as to the relative advantages of casement and sash windows. Architects have their fancies on this question, and the speculative builder follows suit. Both types of window may be made equally wind and weather proof. 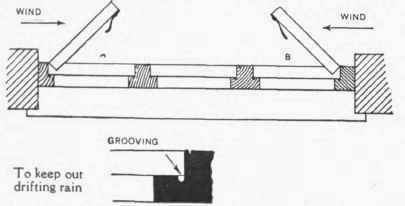 Casements with light frames suffer from the same disabilities as thin doors - they warp out of shape, and then their fastenings refuse to bring them close to the framing. On the other hand, badly fitting sashes acquire tricks of sticking or rattling It should be noted that no sash window can be opened more than half of its area. All things considered, there is a balance of advantage to the casement. It forms an effective wind-shield when opened on the side from which the wind is blowing, and as the casements are usually hinged so that one at least opens on either hand, it always becomes possible to obtain air without too much of it, even in the most boisterous weather.